Business boomed for informal traders outside Constitutional Court during the secret ballot hearing. Business was booming for informal traders outside the Constitutional Court on Monday, May 15, 2017, when opposition parties came to ask the court to rule that the mooted vote of no confidence in President Jacob Zuma be held by secret ballot. A few thousand supporters of the parties had marched from Mary Fitzgerald Square to Constitution Hill to lend support to the legal arguments inside the court, and were keeping track via the live broadcast outside the court. Informal traders saw an opportunity to make money from a political gathering. 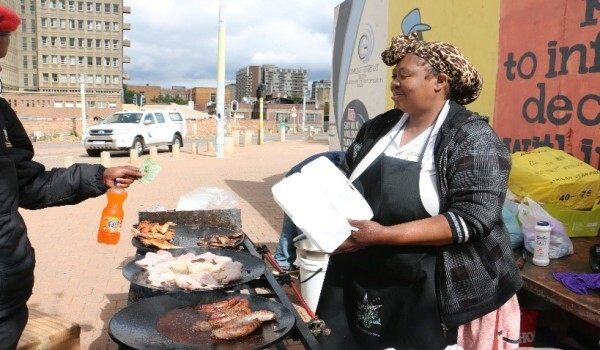 Fifty-two-year-old Tshidi, who preferred not to have her surname published, was selling pap and steak, chicken or wors with a side of salad for R40, and cold drinks. MamTshidi, as she is better known, said that the usual spot is outside Emthonjeni Primary School in Orlando East, Soweto, where she sells sweets and crisps. Simon Fakude, a hawker from Katlehong, who was selling sweets, crisps and cigarettes shared the MamTshidi’s sentiments. He said that although business was not booming for him, he had made more than he did on a regular day. Fakude said that this was more or less the third demonstration he had attended as a hawker.” It’s better than sitting at home,” he said. Mbongeni Momo, who sells political merchandise said “I’m killing two birds with one stone today because I believe Zuma must fall and I’m pushing business. Momo was selling EFF-branded shirts for R170 rand and had sold seven shirts by 12:30pm. “Some people just buy flags or shirts sometimes because they want to feel included, even if they don’t support the EFF. But that’s good for me,” said Momo.